Finding a twitch overlay is hard for game enthusiasts streaming videos online. It is because the twitch market is just blooming. Though there are some websites selling twitch overlays, you will hardly find an overlay which best fits your taste. On the other hand, you don’t know how to make a twitch overlay. 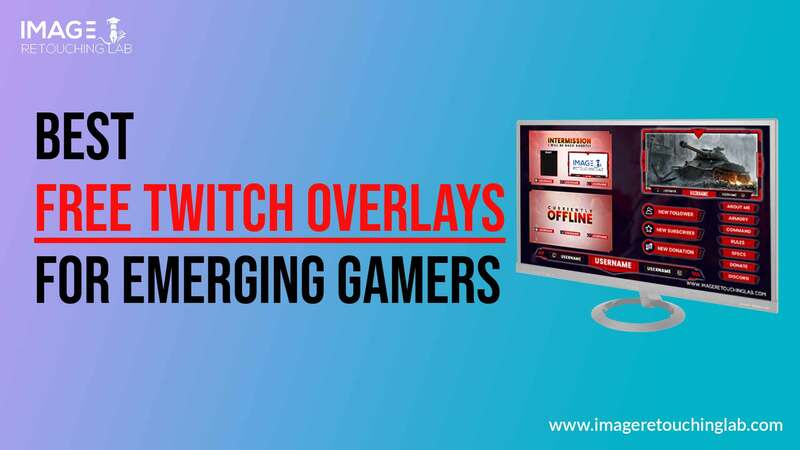 In such a situation, you might think that you don’t have an opportunity to get some free twitch overlays other than to buy from graphics designers. Don’t worry! We have come up with some beautifully designed free overlays from different websites. Check these free twitch overlays to pick one for your channel. Cyan is one of the best free overlays found on the internet. A German site named Zerging offers this overlay for its visitors. The overlay features a light blue color scheme. For its comfortable color scheme, it does not overpower the game you play. Cyan is widely famous for its flexibility with design. To clarify, one can easily mix parts of different overlays and panels with Cyan. The company, however, offers complete packs with many parts. You can use those very parts depending on your needs. You can either use them partially or wholly in your stream. Overall, Cyan can be considered as the best free twitch overlay found on Zerging. If you are a fan of simple designs, then you should give it a try. You might fall in love with this simply designed twitch overlay. Bitter Jungle is an outstanding twitch overlay offered by Stream Play. They are determined to provide their clients with the most appealing designs. In fact, they are working to help gamers brand their channels. As branding anything in the world is a crucial thing, they focus on premium overlays and custom designs. Premium overlays are the best to brand your channel indeed. When it comes to free overlay, Stream Play does not make you disappointed. Bitter Jungle is such an overlay that can attract any kind of gamers out there. It is a nice and clean twitch overlay. It does not matter whether you are a beginner or a professional; you can go for the overlay to stream your gaming videos online. Bitter Jungle, which features a green theme, is a part of their full-stream package meant for video gamers. You will find a lot of options to edit in the overlay. For instance, you can add your streamer name, recent followers, and donation to the overlay without facing any problem. Twitch Temple offers Orbitron for free to their valued visitors. It is probably the most famous twitch overlay on Twitch Temple. Though their main focus is on premium overlays, their free overlays are also great to go. And Orbitron is the most vivid proof for this statement. The first thing you should consider about Orbitron is its color scheme. It comes with a gray and red color scheme. And you will find a set of modular elements in the overlay. If it is necessary, you can modify Orbitron by using those modular elements. This is a great opportunity to satisfy your mind with a free overlay. The overlay also offers a range of twitch panels such as different social media buttons, about me, time schedule, specs and so on. In addition, it offers some special screens namely Twitch Intermission Screen, Twitch Offline Screen, and Twitch Starting Soon Screen. Haunted Twitch Overlay has been developed by Visuals by Impulse. The company offers approximately 36 overlays, packages, and panels for free. And Haunted Overlay is the best overlay among them. Basically, it comes with a creepy purple color to meet the taste of horror-loving users in the twitch industry. The main feature of the overlay are slots for top donation, top bar set up, and recent subscribers. You will get a Webcam Overlay, a Preview Image, VBI Design File, and a Readme File when you buy a package. PUBG Twitch Overlay is one of the handiest twitch overlays for the addicts of PLAYERUNKNOWN’S BATTLEGROUNDS. Twitchgfx is the owner of this beautifully designed overlay. The company provides professional overlays for streamers. It is highly determined to make gamers stream stand out. Consequently, the experts of the company have designed a great number of twitch overlays for emerging streamers in the twitch industry. They have both premium and free twitch overlays on their websites. PUBG Twitch Overlay falls in the free category of overlays. Though the overlay is free, you will find nothing making it unprofessional. In fact, the overlay comes up with some great features. The main features of the overlay include a camera frame, stream offline, and a bunch of twitch panels. The twitch panels of the overlay are twitter, facebook, about me, schedule, and specs. Project Dark is another great twitch overlay offered by Twitchgfx. This a perfect overlay for those who are just starting out. If you are a beginner in the industry, then you can also go for it without feeling any hesitation. You will hardly find a free overlay like it. This simply gorgeous overlay comes up with a bunch of stunning features. Like all other twitch overlays, Project Dark offers a Facecam along with some twitch panels. The panels include facebook, youtube, about me, and so on. The top bar of the overlay is highly eye-catching. Viewers will be bound to have a second look at the top bar. However, the top bar of this beautiful twitch overlay is compiled with two social media logos and the name of your channel. As a result, the top bar looks clean and crisp at the very first sight. If you are a Fortnite player, then Storm Call is meant for you. It is a mesmerizing overlay Fortnite gamers. The overlay, however, is offered by TwitchOverlay. The website has a good number of premium and free overlays. Amongst them, Storm Call is beautiful enough to draw the attention of Fortnite gamers. Storm Call has a lot of features for which it stands out uniquely. When you are ready to download the overlay, you will be glad to get a bunch of panels packed with the download file. In fact, you will get 4 stream alerts, some social icons, 4 panels, and 2 webcams. And all these things are totally free for gamers. The overlay will go smoothly anywhere in the virtual world. For instance, you can use it on Twitch, Youtube, and Mixer. But there are some overlays that do not fit all the streaming sites. Storm Call is different from this point of view. So, you can choose it for your upcoming channel without feeing any kind of hesitation. Twitch Temple has designed an outstanding overlay named Stone Fire. The company offers this overlay to its valued customers for free. This free overlay is one of the most perfect overlays for the beginners in the twitch industry. Stone Fire is basically green-themed overlay. And many any gamers, as well as viewers, prefer green color since the color is comfortable for our eyes. However, the overlay comes up with multiple variations and presets. You will find a modular supporter section and a webcam frame. There are some other free features available for you. And if you are not satisfied with the free features of the overlay, you can upgrade it to the premium version. In the premium version of the overlay, there are animated elements, alerts, and screens. These pro features will help your channel get established in a very short period of time. No Man’s Sky is a free twitch overlay offered by NerdorDie. The company has professionally created this overlay since it has professional experience in making twitch overlays, stream designs, and alerts. Though the company initially started as a tutorial website, it turned itself into a brand in the industry of streaming design products. The overlay, however, has been made for one of the most favorite games named No Man’s Sky. You may find many overlays for this game out there, but this one is good enough to give it a try. The overlay has a bunch of features such as webcam, supporter section, alerts, twitch panels, and stream widgets. All these features are handy for Mixer, Facebook, Twitch.tv, Mixer, and Youtube. So, you can begin your journey in the game streaming industry with this free twitch overlay to avoid any potential problems related to the overlay of your channel. Ghost Rising is one of the best free overlays offered by TwitchOverlay. The overlay is suitable for almost all the games, especially for the Destiny games. It is, indeed, the most perfect overlay for the Destiny games. The overlay has a number of features for its users. Basically, it comes up with a collection of info panels and stream alerts. You will also get a number of social media icons which you can use according to your taste and needs. You can pair other stream graphics with this overlay if you want. In the end, you have got to know some of the best free twitch overlays available on the market. Now, try to pick one of these overlays for your upcoming gaming channel. All of these overlays are good for beginners like you. However, if you think you need a professional touch on your channel, then you can go for twitch overlay designers. In this case, we recommend you to choose Image Retouching Lab as it is one of the leading twitch overlay makers in the industry.